Head Start provides 1-2-1 private therapy for ex-service personnel with mild to moderate mental health difficulties such as depression, anxiety, PTSD and adjustment disorder. Therapy is provided via face-to-face and digital sessions. Evidence-based talking therapies including cognitive behavioural therapy (CBT) and Eye Movement Desensitisation Reprocessing (EMDR) are delivered by accredited private therapists within the ex-service personnel’s local community. The NHS is central to ex-service personnel receiving support with their mental health and Head Start are referral partners with the NHS specific veteran teams, therefore these teams should be contacted in the first instance. Click here to download a list of NHS teams that specifically support ex-service personnel and who accept self-referrals. However where the NHS have been accessed and treatment is unavailable or there are long waiting times, Head Start can offer its private therapy support. All referrals to Head Start are to be received from healthcare professionals, including those in other military charities and MoD department of community mental health (DCMH) teams, and NHS teams. Click here to download the Head Start leaflet. Are you a healthcare professional looking to refer to Head Start? If you are a healthcare professional considering a referral to Head Start, please click here for our Client Referral Form and further information. Are you a therapist looking to support the ex-service community? 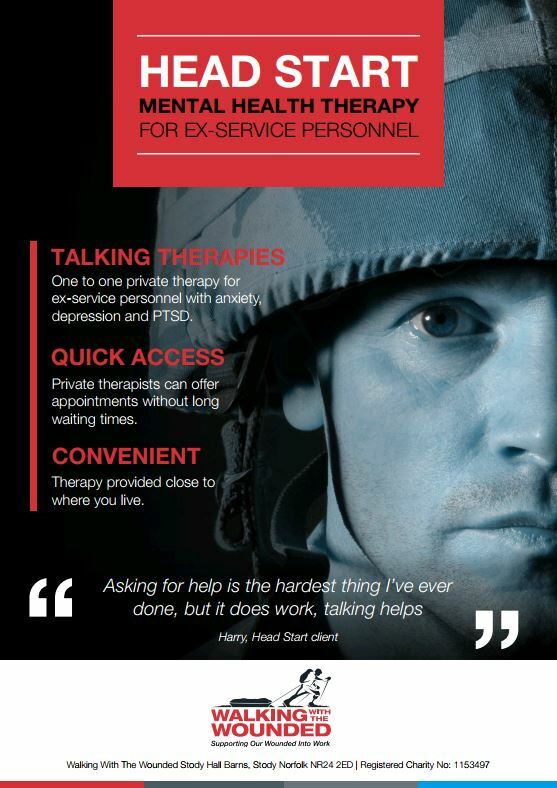 We always welcome new therapists who would like to offer their services to ex-service personnel. Therapists who are accredited members of BACP, or registered with BABCP or EMDR UK & Ireland and HCPC/BPS members are all eligible to become a member of Head Start’s national network of private therapists. Click here for our Therapist Application Form and further information. Are you serving or ex-forces with ﻿questions about the Head Start programme? For emergency support please view our list of appropriate support providers below. You can also download a printable version of this list here. We are proud to be a partner of Contact - a collaboration of leading military charities, the NHS and the MoD, who work closely together in order to ensure that the best possible mental health support is available to those who have served in the British Armed Forces. For more information, please visit the Contact website. As a member of Contact, we comply with the following principles: Guiding Principles for the delivery of Veterans’ and Service Families’ Mental Health Cares.